I originally came across Jan’s book in the New Releases section of my local library and picked it up out of curiosity. Once I had a free evening to sit down and read it, I was so impressed that I contacted Jan to see if she’d allow us to feature the book in the magazine. This is one of the most beautiful books I have ever come across. The textured cover, full color stitched pages, and lovely photography all add to the exquisite experience that is reading this book. Just glancing through the lovely pages inspires me to get up and actually make something. I also really appreciate that, no matter which page I am on, the book lays flat. The folks who bound this book and so thoughtfully made everything about it work together really ought to be applauded. The book begins with a bit of a “meet and greet” with some of Jan’s favorite herbs and flowers. She introduces us to each plant, tells us a bit about it, then lists the recipes in which you can find it as an ingredient. This section is followed by some need-to-know information about preserving, storing, working with and infusing herbs. Then comes another meet and greet, this time with carrier oils and additional ingredients we’ll be working with as we make our way through the recipes in the book. The recipes are all absolutely stunning. Skin care products, salves, balms, butters, lotion bars, creams and lotions, bath salts, melts and scrubs, lip products, hair care products, homemade soaps, products for pets and the home, and a wide variety of herbal remedies are all presented in easy-to-follow, beautifully photographed recipes that have been thoughtfully perfected and shared so we can make them ourselves at home. Every recipe I have made has turned out so wonderfully. This book has fast become one of my absolute favorites. A trustworthy resource with truly effective recipes for products fit for gift-giving. It belongs on every plant lover’s shelf. Many thanks, Jan! Jan's newest book about soapmaking is so inspiring and lovely. Every single recipe and project she has included is thoughtfully, beautifully presented. I've never wanted to try making homemade soap as much as I do when I read through her book! My favorite part of the book is the photo gallery demonstrating all of the colors and shades (99 examples) you can achieve with natural coloring agents like clays and botanicals. There is truly no limit - each option is absolutely gorgeous. 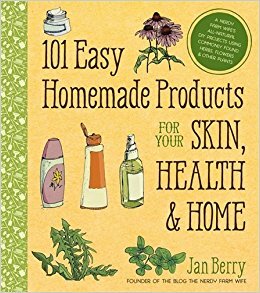 Thank you for another inspirational book that showcases natural, whole ingredients, Jan! I recommend this book to everyone who is interested in natural options for personal care products. Jan Berry has also written a guest post on our blog. Find her recipe for yellow rose lotion bars here.